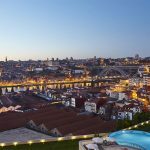 Porto is a fantastic location small and medium sized corporate events, with a great blend of historic buildings, accessibility and the feeling of intimacy that comes from a relatively small city. 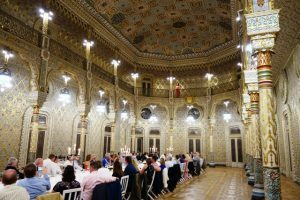 We have just run a two day conference with gala dinner in the historic centre, which included many of the magical things that Porto has to offer. 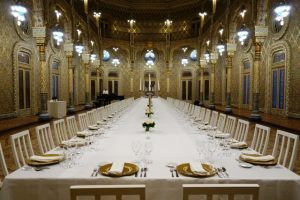 The gala dinner was held in the Palácio da Bolsa, a historic commercial building dating from 1842, which can host dinners for up to 550 people, whilst also offering various smaller and medium-sized rooms. 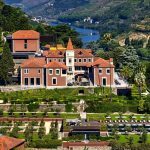 They have an onsite restaurant which produces first quality food and it really is one of the best locations in Porto for a gala dinner. In this case we added some fun and entertainment to the gala dinner by disguising two opera singers as waiters who burst into song before revealing their opera costumes. 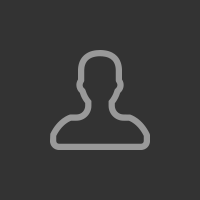 In the picture below you can see one of the opera singers singing from the gallery. 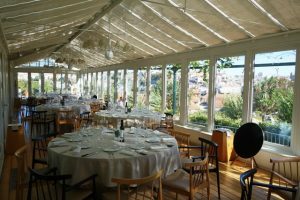 As well as the gala dinner in Porto, we also organised a conference and lunch at the Graham’s Port cellars (see below), which has the award winning “Vinum” restaurant and a couple of conference rooms with breathtaking views over the river Douro. 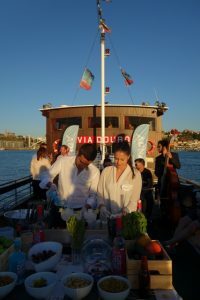 To finish the corporate event, we organised a sunset boat trip on the river with a live band and gin bar shown here. 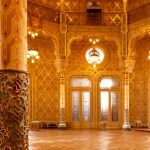 If you are looking for a conference and/or gala dinner packed with culture, great food, history and the unexpected, then please contact us at PortoEvents so that we can make a unique package for your requirements.